About a month or so ago, I bought a package of green lentils from Whole Foods. I didn’t buy them for any specific reason other than I wanted to give them a try in something other than a canned soup. I hadn’t really narrowed down a recipe until this week, when I was reminded of a recipe that a friend shared for Honey Baked Lentils. This sounded perfect! I even had a spaghetti squash in the fridge that I could use as a base for the lentils. The best thing about this recipe is that it is gluten-free in it’s natural state. I love running across recipes like this! Preheat oven to 350. Mix all liquid ingredients in a bowl and whisk well. Add rinsed lentils and bake, covered, for an hour and a half or until tender. You can also saute and throw in veggies, or sub in a bit of rice for some of the lentils. 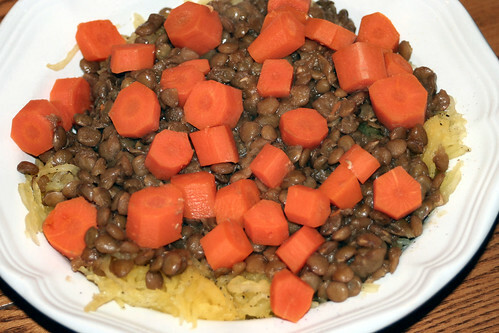 **I threw in some steamed carrots to my bowl of spaghetti squash & lentils. I get a daily email update from Mind, Body & Spirit Fitness and one of the links in the email the other day was the Top Ten Healthiest Foods on the Planet. I was pleasantly surprised to see that all of these foods were gluten-free!!! YAY!! Not only that, but these were all foods that I eat on a very regular basis. I guess I am doing something right, huh?? This recipe is one that was passed onto me from my sister. I think my sister got it from her sister-in-law. I made a few changes, due to foods that I can’t eat and that my family won’t eat. This is a fan favorite in our house. It is easy to put together and reheats very well. 1. Brown ground meat and add taco seasoning per directions on packet or container. 2. Preheat oven to 350 and warm up your beans and chili. 3. Warm your tortillas up in micro according to pkg. directions. 4. Spread a little chili (not too much, you need to top the whole casserole with chili at the end) in the bottom of a glass pyrex dish. 5. 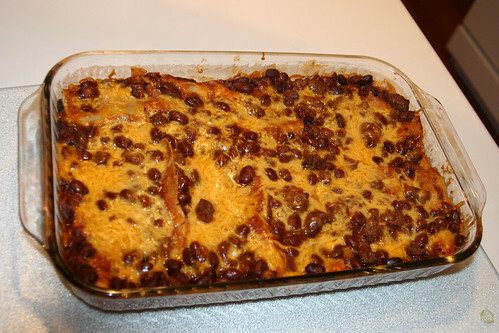 Start to assemble your enchiladas: tortilla, beans, meat, cheese…then roll up and place seam side down in pyrex dish. Repeat until you are done. I do 6-8 length wise, then I stuff the remainder in along the side. 6. 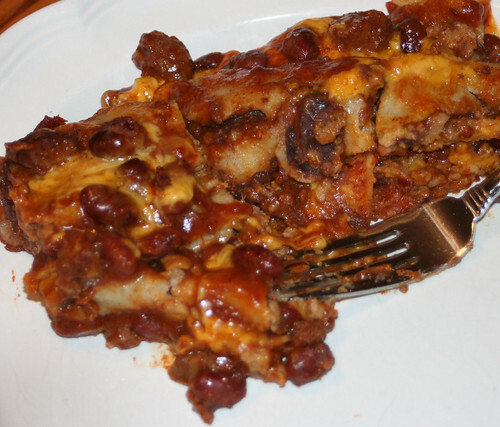 Top with remaining chili and then cheese. Cover and bake for 30 – 45 minutes or until cheese is all melty and casserole is bubbly. 7. Let cool for 5-10 minutes; cut and serve.